Where do you start with thousands of securities to choose from? Expert Advice is right at your finger tips, when and where you need it. Test and compare BEFORE you spend your first trading dollar. Check the probable direction of prices to set more precise profit targets. There are thousands of stocks, currencies, options, and futures out there. Which ones do you choose? With the MetaStock Explorer™ you can use YOUR criteria to scan a universe of securities to find the ones that fit YOUR strategy. The list of possible scans is almost endless. Not only does this save countless hours of sorting and sifting, but it allows you to do things you simply could not do otherwise. Expert advice is right at your finger tips. The MetaStock Expert Advisor™ gives you the input of industry professionals when and where you need it. Display the industries most popular systems and charting styles with the click of a mouse. Need more info? 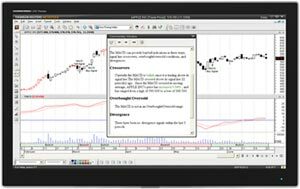 Choose the commentary screen for specific information about the security you are charting. For example, you can learn: “What is a MACD and where should the buy and sell signals occur on the chart?” You can even create your own system using the easy-to-learn MetaStock formula language. Alerts keep you in touch with current trading conditions. Use simple price and volume alerts or complex indicator triggers and multiple condition alerts. This window shows you in great detail how your expert assesses the chart you are viewing. Is it a buy, sell, or hold situation? If so… Why? You get insight gained through years of research and real-world trading. Buy and sell arrows, text, or any other symbols in the MetaStock palette automatically flag special conditions, according to your criteria. 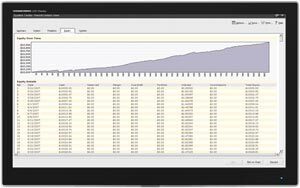 With the exclusive MetaStock Enhanced System Tester™ you can create, back-test, compare, and perfect your strategies before you risk any money in the markets. The Enhanced System Tester also shows you which securities work well with which systems. Unlike other systems that allow you to test only one strategy on one security, the MetaStock Enhanced System Tester allows you to test multiple securities against multiple strategies. Test one system with one security, many systems with one security, one system with many securities, or many systems with many securities. Designed to simulate a realistic trading scenario, the Enhanced System Tester allows you to change and edit variables such as entry, exit, expanded stops, order sizes, commissions and more. 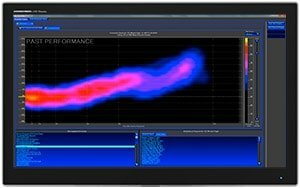 The reports generated by the Enhanced System Tester are comprehensive and presented in an easy-to-read, intuitive format. Imagine if you had a tool that could paint a more probable, easy-to-read picture of the future? A picture based on patent-pending technology that uses any or all of 67 event recognizers. A picture that helps you more precisely set profit targets and stops. That’s what you get with the MetaStock Forecaster, the latest PowerTool available exclusively in MetaStock XIII and MetaStock Pro XIII. The FORECASTER plots a “probability cloud” based on your selection of any of 67 event recognizers. It uses advanced mathematics to examine the price action after these events to determine the probable performance of future events. 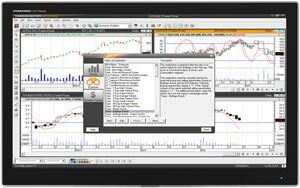 The FORECASTER offers new ways to analyze trading signals and provides insight to future performance. What do you get with the latest MetaStock Version 15? Name-Brand Systems such as Bollinger Bands, Darvas Box, SPYDER Carpe Diem, Conners RSI, and many many more.